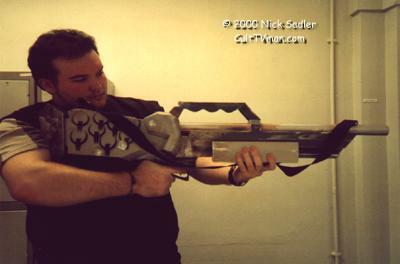 We start off this week with a look at Nick Sadler’s Quake 2 Shotgun. We first viewed this back in December. I’m back with more pictures of my Quake 2 Super Shotgun. Since the last posting, I’ve spent a further 30 hours working on the piece – experimenting with various techniques materials and explosives to obtain the looks. To make the gun look metallic, I used Silver aerosol paint as an undercoat. I followed that with the regular paint, applying it as if over any other normal undercoat – then when weathering, using a hefty wire brush I could scratch and scrape the colour off to reveal the metal-like paint beneath – a technique that I found to work especially well in this project. Those that know the game will instantly notice that the colour sceheme is a little fictitious, this was all my doing – colours were applied to the bits that fit best. Colours also followed materials – Metallic parts were green/grey, carbon/plastic parts coloured black. The stock is looking a little more beaten up – this was the silver undercoat – Green topcoat then attacked with a lighter and WD40 can. after about a 5-7 second burn, the plastic was jelly-like, but not burning, with thick gloves the plastic can be molded well – the cooled plastic looks like bent or beaten metal. the stock of the gun now features 4 bullet strikes. these were made by fucosing a flame on about a square inch then ores it inward evenly with a fingertip. After a little sanding, and some chrome paint, the holes look convincing. 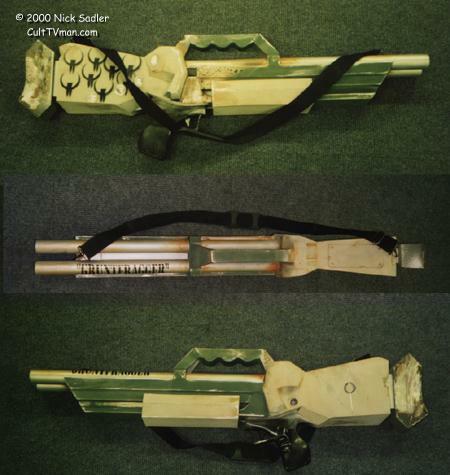 on the reverse of the stock, there are now notch or kill marks – this was simply a stencil and black spray combo.. as was the “GRUNTFRAGGER” name stencil on the barrel. the orange rust weathering on te barrells was an orange paint mix – thinned with WD40. The WD40 gives a very good medium for painting oil and dirt onto a project, However it takes about 4/5 days to dry fully. 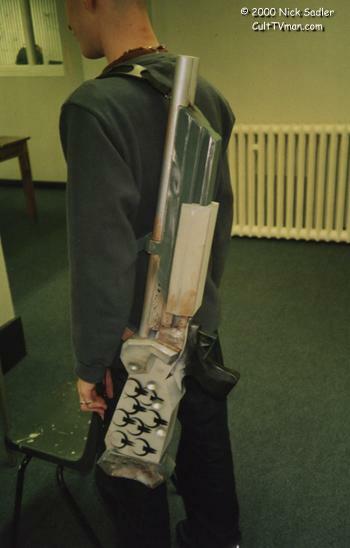 The Shoulder belt as seen in the photos would allow the gun to be worn – The photos include two colleagues from University – Ed Shaw, with his back turned, and the gun over his shoulder, and John McArdle holding the gun combat style with the stock under his arm. I’m holding the gun as if holding a rifle – the strap folded beneath. 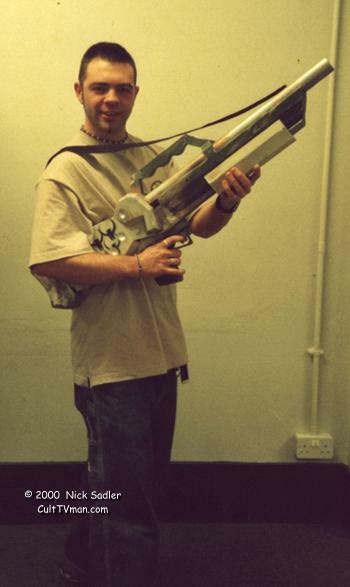 I’m presently awaiting contact from ID software regarding this super shotgun as a kit..